Jun Nakayama was a silent film star in the early days of Hollywood, but by 1964, he is living in complete obscurity--until a young writer, Nick Bellinger, reveals that he has written a screenplay with Nakayama in mind. Jun is intrigued by the possibility of returning to movies, but he begins to worry that someone might delve too deeply into the past and uncover the events that led to the abrupt end of his career in 1922. These events include the changing racial tides in California and the unsolved murder of his favorite director, Ashley Bennett Tyler. 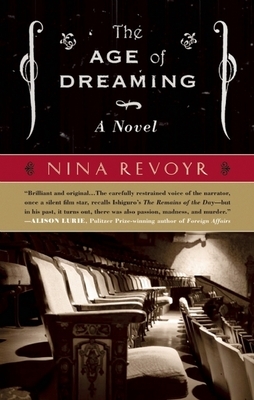 The Age of Dreaming is part historical novel, part mystery, and part unrequited love story. Nina Revoyr was born in Tokyo to a Japanese mother and a Polish-American father, and grew up in Japan, Wisconsin, and Los Angeles. She is the author of two previous novels, The Necessary Hunger and Southland, which was a Book Sense 76 pick, winner of the Ferro-Grumley and Lambda Literary awards, a finalist for an Edgar Award, and one of the Los Angeles Times' "Best Books of 2003." She lives and works in Los Angeles. Nina Revoyr was born in Tokyo to a Japanese mother and a Polish-American father, and grew up in Japan, Wisconsin, and Los Angeles. She is the author of two previous novels, The Necessary Hunger and Southland, which was a BookSense 76 pick and won the Ferro Grumley and Lambda Literary Awards.